Normally when most of us think of Khaleeji style, we picture black abayas and shaylas, with bright accessories. But Gulf girls here in London have a totally unique style. I saw this outfit on a girl in Bayswater quite a while ago, but since the weather's so unpredictable, I think coats can still feature in your wardrobe! I kid you not this was exactly what she wearing: a knee-length, green, voluminous bubble hem dress (closer to the 1st dress in colour) under a slightly shorter purple coat, black jeans tucked into chunky biker boots, all topped off with a black Gulf-style shayla. So original! 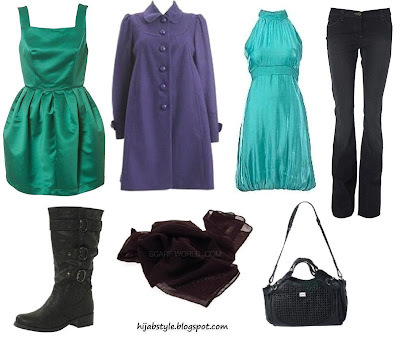 Green prom dress £50, Topshop; purple coat £50, Oasis; bubble hem dress £28, New Look; black bootcut jeans £15, Dorothy Perkins; biker boots £30, Dorothy Perkins; black chiffon scarf £3.99, Scarf World; black lattice grab bag £65, Dorothy Perkins. The jeans are supposed to be bootcut, but for some reason they look really tight in the picture. Anyway, if you don't like tucking jeans in (which I don't), just wear them over the boots with a really chunky heel to get a similar look. still pondering, whether too, I wish people would be less judgemental take care sister in Islam I love the fashion you put up its so insipiring love it!!! i love going to queensway/bayswater as there are so many great hijabis there and some really interesting styles especially on a sunday and the summer is when the really pretty styles come out. have brought 4 new hijabs today for £5 in hounslow and they go great with my new found wardrobe lol. wow The dress and jeans look really pretty and I think they would go well together, can't imagine it with the boots though. Anon, thank you! Regards your hijab, as long as everything is covered that needs to be, then there should be no problem! Just ignore these people who nitpick over the silliest things, and tell them to look at themselves before criticising others! Aisha, thank you! Yeah it's an unusual combination, but it looked great on her! I missed you too ;) For a sec I thought you were going to embrace the skinny jeans being tucked into boots look! I can't stand it not just because the look would be revealing but because the idea of have such a thick material such as denim stuck to my legs makes me feel claustrophobic! Anon 1, glad you liked it! Anon 2, you're welcome. I've just written the review, let me know what you thought of the show! ymiss, aww hehe thanks :D Nah don't worry. I actually own those jeans and they're quite loose so not to worry. You know skinny jeans are bad for your health because they can cut off circulation to your legs if they're too tight lol. Ammena, yeah it's pricy but I thought it'd be perfect with this outfit.